September 16, 2015 – For many people, being inducted into a Hall of Fame is enough of a “lifetime achievement award.” Longtime Heaven Hill Master Distiller Parker Beam received that honor in 2001, when he was a member of the Kentucky Bourbon Hall of Fame’s inaugural class, but put even more passion into making whiskey in the years that followed. Parker was forced into semi-retirement last year because of his ongoing battle with amyotrophic lateral sclerosis (ALS), also known as “Lou Gehrig’s Disease,” but continues to hold the title of Master Distiller Emeritus at Heaven Hill. 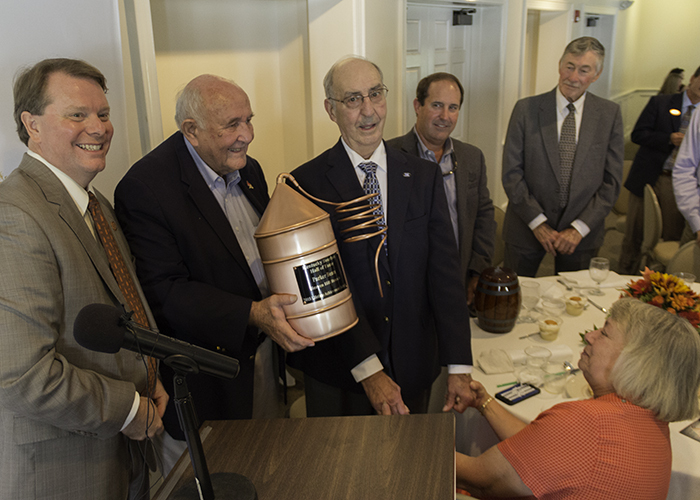 “It’s a privilege to call him my friend for over 40 years,” Wild Turkey Master Distiller and fellow Bourbon Hall of Fame inductee Jimmy Russell said in presenting the award. “What he’s done for the Bourbon industry, what he’s continued to do…all of us are proud of what he’s done with his legendary Heritage package that he’s putting out.” The Parker’s Heritage Collection series of annual whiskey releases from Heaven Hill has become a major fundraising project for ALS research and support over the last three years, raising around $500,000 for the ALS Association’s “Parker’s Promise of Hope” fund. Heaven Hill donates a portion of the sale price of each Heritage Collection bottle to the fund. Parker Beam was diagnosed with ALS nearly three years ago, but remains as active as possible despite the debilitating disease, which attacks the cells in the nervous system that control voluntary muscle movement. “I ride my (stationary) bike about 10-11 miles a day, and I do it in about 35 to 40 minutes every day…that’s my therapy,” he said in an interview after the presentation. “I get around on the farm in my Gator, but I don’t drive much anymore.” He also stays in touch with the distillery almost every day and visits when he can. The presentation capped off the induction of four new members to the Hall of Fame, including the late Sen. Wendell Ford and the late Owsley Brown II, former chairman and CEO of Brown-Forman. Kathleen DiBenedetto was inducted for her work creating Beam’s Small Batch Collection of Bourbons with the late Booker Noe and helping to build a hospitality industry education program. Donna Nally was inducted for her role in creating both the Kentucky Bourbon Trail and the Kentucky Bourbon Festival, while also developing the original visitors center at Maker’s Mark Distillery. The Kentucky Bourbon Hall of Fame is jointly administered by the Kentucky Distillers Association and the Kentucky Bourbon Festival, with inductees nominated by members of both organizations.